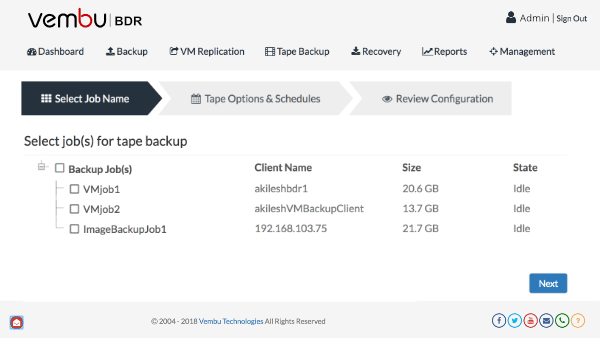 Vembu offers Native Tape Backup support for Image-based Backups (VMware, Hyper-V, Physical Windows Server and Workstations). Many organizations are urged to retain their enormous amount of data for a longer term and thus backing up to Tape is continuing to be a significant practice. With Vembu’s Tape backup support, organisations will now be able to backup their data to tape for long term archival purposes while providing secure and reliable access to the stored data. Vembu Native Tape Backup support helps the organisations in implementing the best known 3-2-1 backup strategy of having 3 copies of your data in 2 different storage media and 1 backup copy offsite. Mostly organisations rely on Tape backup solutions for Long-Term Archival and Offsite Storage. Vembu Tape Backup allows you to store all your data for longer period of time and makes it available in circumstances like Disaster Recovery and Compliance reasons.